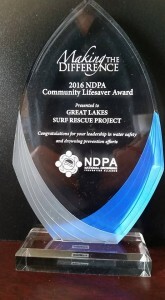 GREAT LAKES, USA – The Great Lakes Surf Rescue Project (GLSRP) is proud to announce that it and the Matthew Kocher Foundation both won National Drowning Prevention Alliance’s “NDPA Community Lifesaver” awards and ‘Because I said I would’ “Supporter of the Year” awards. The two nonprofits have been working together since 2014 to advocate water safety in schools and to the public. 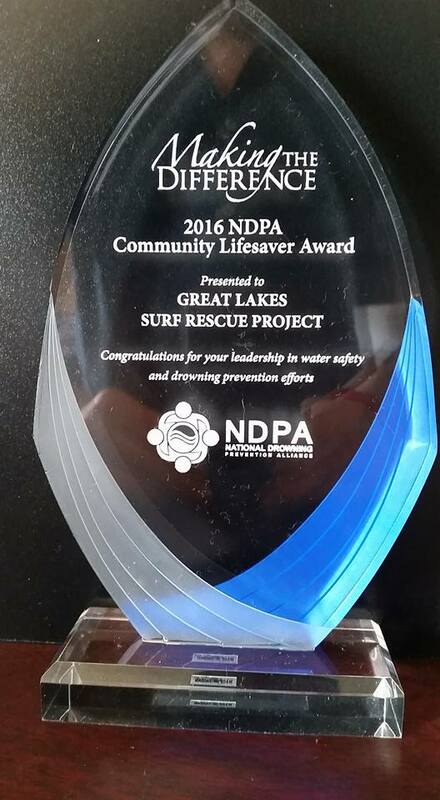 On March 29 the Great Lakes Surf Rescue Project and the Matthew Kocher Foundation each received the “2016 National Drowning Prevention Alliance (NDPA) “Community Lifesaver” awards. The GLSRP was recognized for its water safety advocacy in the Great Lakes region and the Matthew Kocher Foundation was recognized for its water safety advocacy in Illinois. 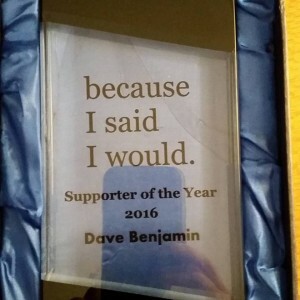 The GLSRP Co-founder and executive director, Dave Benjamin, of Homewood, IL became involved in water safety after he survived a drowning accident while surfing in Lake Michigan December 26, 2010. On July 27, 2013 John and Kathy Kocher of Tinley Park lost their only child, Matthew, 15, to a Lake Michigan rip current in New Buffalo, MI. Since losing him, they have made a commitment to help others and have not stopped. They created the Matthew Kocher Foundation (www.mk56.org) and work endlessly and unselfishly to help educate and promote water safety in the community to reduce and prevent loss of life. Since 2010, the GLSRP has performed over 229 Great Lakes Water Safety Presentations in 7 of the 8 Great Lakes states; 127 of those presentations were sponsored by the Matthew Kocher Foundation. The two nonprofits are teaming up again this week with 40 high school presentations and 1 Boy Scouts presentation (List of schools below). 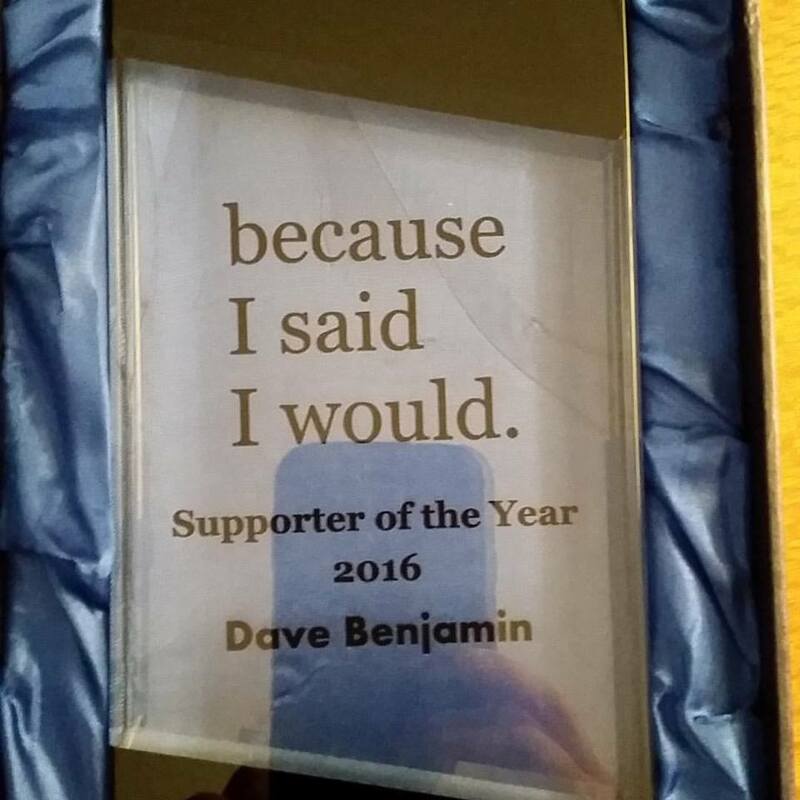 On April 28, the Dave Benjamin of the Great Lakes Surf Rescue Project and John & Kathy Kocher of the Matthew Kocher Foundation traveled to the Cleveland House of Blues and each received the “2016 Supporter of the Year” awards presented by the nonprofit, ‘Because I said I would’. Because I said I would is a social movement and nonprofit dedicated to the betterment of humanity. 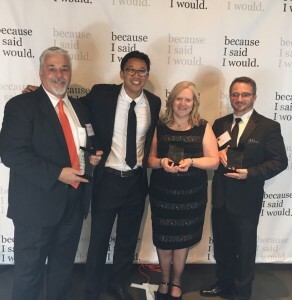 In September 2014, Dave Benjamin and John and Kathy Kocher each recorded Promise Videos at a ‘Because I said I would’ conference in Columbus, OH. Benjamin’s Promise Video titled “Drowning Doesn’t Look like Drowning” talks about his drowning accident and ends with his dedication to water safety and the creation of a water safety school curriculum. 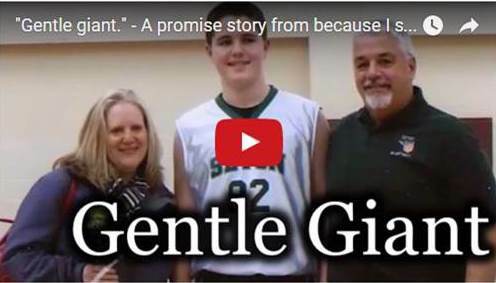 The Kocher’s Promise Video titled, “Gentle Giant,” memorializes their son, Matthew, and promises to promote water safety through a foundation in his name. 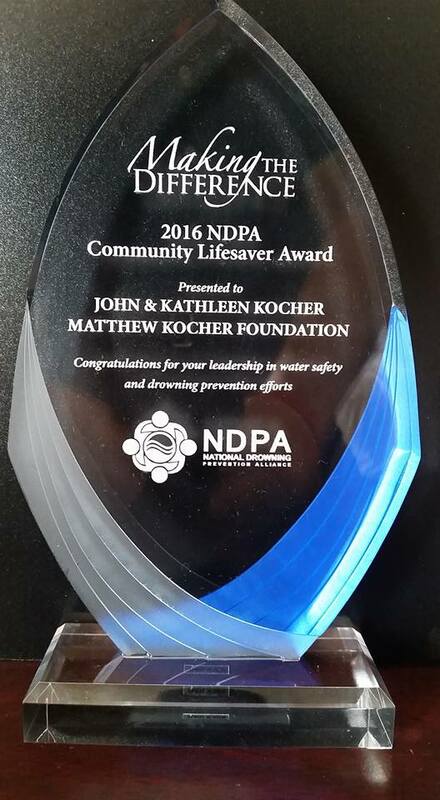 The Matthew Kocher Foundation is a 501c3 nonprofit organization that provides Water Safety, Scholarship, and Community Service. With the motto of “Working Together to Help Others” the Matthew Kocher Foundation originated in the hearts of Matt’s parents, John and Kathy Kocher. The Foundation’s mission is to carry on Matt’s spirit of caring for others by offering water safety education to prevent future drownings and save lives. Matt’s parents do not want any other families to experience the anguish of going through such a preventable tragedy. The Foundation also provides scholarship awards to deserving students and provides community service opportunities to young people. Because I said I would is a social movement and nonprofit dedicated to the betterment of humanity. We make and keep promises to end suffering, establish peace and build happiness. Our mission is to strengthen humanity’s will. We created the “promise card” to help hold people accountable to their commitments. Make and keep a promise to improve yourself, your family or your community. If you need a promise card to make the commitment real, we will send you one. The world needs you.